Happy Monday morning! Thanks for stopping by! It hasn't been a great reading week for me, but hopefully it has been for you! I did have a great blogging week! I joined in the Book Blogger Hop hosted by Crazy-for-Books and ended up with several new followers. Welcome to my blog! I didn't manage to complete any adult books last week. 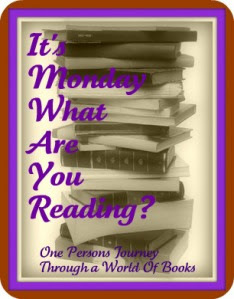 I did read and review Ima Nobody Becomes Somebody by Brenda Poage. It's a children's book about bullying. I also published my weekly What My Children Are Reading recap. So I guess it was a big week for kids books around here! I've been reading A Hundred Feet Over Hell: Flying with the Men of the 220th Recon Airplane Company Over I Corps and the DMZ, Vietnam 1968-1969 by Jim Hooper, and I'm enjoying it. But I just haven't had a lot of time to read this past week. I'm hoping to finish it soon! The Piano Teacher: A Novel by Janice Y. K. Lee ~ whenever it's finally available from the library! Hope you have a better reading week than last week's !! I've had a slightly slow week too! You sound busy! :)I need tot ry that Blog Hopper - I love visiting blogs. Is that on Fridays? I need to check it out. I'm going to have to go back and check out your review of Ima Nobody (I'm so behind in my reader, it's ridiculous! ), because I just got it last week and I'm not so sure about it. Anyways...so glad to see more visitors for you! I've gotta try the Blog Hop this week I think! Same kind of week here - not a lot of time for reading (or blogging) - just too much other stuff going on! Hope we both get more reading time this week..